Web 2.0 tools have critically elevated the social networking activity and skills of individuals. Not only are young people highly active in social networks, but older individuals are also showing a huge increase in their use of these tools. The attraction of older age groups is, of course, social connection and community building among professional and casual peers and friends. 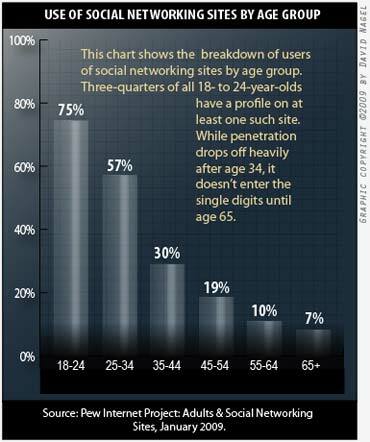 The following graph of a Pew Internet study shows the various age groups and the increase of use. Much has been written recently about the impact of social networking tools in teaching and learning and how educators can build on the skills of their students in using these tools. My discussion here does not negate that good work but introduces the idea that social networking is only the beginning of a longer and more complex process of socially constructed learning and ultimately collaboration and knowledge building. That is, if educators only integrate the ability of students to connect and socialize, deeper points of learning will be missed. While good teaching and learning rests on effective relationships (Cummins, 2000), in an active learning community, those relationships should evolve into actual idea exchange and knowledge construction. The most effective pedagogical approach using new technology is social constructivism, as it builds on social interaction and engagement, which is at the heart of Web 2.0 technology. As I have already mentioned, the rise in social networking is not only with younger generations, but it is the younger generations who are actually changing how instruction is delivered and evaluated based on their high level of social engagement using technology in various aspects of their lives. In general, social networking provides new ways to connect and share information and create networks of interest. So, while in more traditional learning environments much of this must be orchestrated and planned by the instructor and organized through the grouping and pairing of students, when using a social networking tool this level of connection can happen immediately. It is often considered quite "cool" by students when teachers also have Facebook links and provide a shared group for the class online. A note of caution here: Sometimes, if the instructor's presence is only social in nature, it can seem "creepy" to students and an intrusion on their social space. Owing to this, specific instructional use is more effective and acceptable for students to understand why the teacher has created the space. While this level of connection and shared information is a great first step in community building, it does not necessarily lead to learning communities or the sharing of ideas. This must happen intentionally and is where the instructor is very much a necessary support to the process. The following are several important steps an instructor should take in order to engage students beyond social networking to the social construction of knowledge. Maintain a constant presence: Understand that younger students' view of social networking is constant, not a "9 to 5" kind of connection. Use a variety of supporting tools to process information. Also understand that younger students are used to the whole multitasking idea and can, therefore, utilize a variety of tools at once (blogs, wikis, microblogs, etc.). This maximizes variety in how information is processed and applied. Actively synthesize broadly scoped ideas into workable focus areas: Teacher intervention is crucial in making sure that ideas are "managed" and grown and that students stay focused on their goal. Synthesis is also a high level skill that students can benefit from observing, so showcase your methodology throughout. Continue to engage students: Stay aware of all your students--how each one learns and how each one needs your coaching. As varied as the tools, keep your approach customized to each student so that every individual feels connected to the subject at hand. Frequently, integrate the new ideas that your students offer as part of this engagement so that they understand their participation in the learning community. A recent 2009 case study explored the instructional benefits of social networking tools in building learning communities (TCC 2009: Using Social Networking Tools to Build Learning Communities: A Case Study of the Punahou Technology Lab School Ning, posted by April Hayman, April, 2009) The study worked with school children in grades 4 through 10 at a school in Honolulu, HI. What was discovered was that while there were the usual challenges with new technology tools, such as orientation and lack of student confidence in their use, there was an increased challenge to actually "present" ideas publicly. While the technology proved incredibly useful in terms of hosting a variety of media resources and storing large amounts of information, the challenge was with the students becoming "learning community participants." That is, seeing their own ideas as valuable to the wider community and sharing those openly. I would suggest that this is not new to instruction as it is a continuing challenge to all teachers to encourage confidence and learner autonomy and to develop collaborative learning skills that will benefit the students throughout their entire lives. What social networking tools provide is a forum for this work to take place but only with relevant and expert intervention by the instructor. As we begin to focus more on the learning process, it becomes evident that various skills are developed as a result of using specific tools or applying ideas to a specific context. For example, the skills of discussion and dialog can be enhanced through in-class or online discussion groups, and collaboration can be developed through ideas sharing and concept building. It is important to recognize, however, that with Web 2.0 tools a host of skills can be developed, sometimes sequentially and sometimes simultaneously. Blogger, Marcia Connor, posted the following Sunday Oct. 19, 2008: "These new literacies almost all involve social skills developed through collaboration and networking. These skills build on the foundation of traditional literacy, research and technical skills, and critical analysis hopefully addressed in each classroom and every home. Our goals should be to encourage children and youth to develop the skills, knowledge, ethical frameworks, and self-confidence needed to be full participants in contemporary society." Negotiation: the ability to travel across diverse communities, discerning and respecting multiple perspectives and grasping and following alternative norms. While these are clearly social in essence, we must realize that they can be developed in a variety of ways and as a result of a variety of technology uses. It is interesting that these skills and those also listed in the blog are not isolated, but each one is interrelated in some way. In other words, rather than an activity being task-based with only one method of completion, if students are provided with a problem to solve or information to research and discuss using a variety of tools, many related skills will be developed. Therefore the actual process of learning becomes rich and diverse and much more likely to meet more learning needs of students. So social interaction and relationships can be an integral part of learning more than ever and can certainly enrich the learning experience for our students. What is vital to realize however, is that the motivation created by these kinds of networks must be maximized by the instructor to benefit the students in their growth and development as learning community participants. It is important to move students beyond social interaction to the kind of learning communities that are dynamic, rich, and very much reflective of the students who are participating. Cummins, J. (2000). Language, power and pedagogy: bilingual children in the crossfire. Clevedon [England] ; Buffalo, NY : Multilingual Matters.